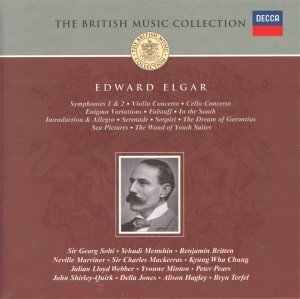 This is an extremely inexpensive collection for Elgar �dissidents�. It skirts around the standard Elgar hegemony of Boult, Barbirolli, Handley and Downes. Menuhin puts in an appearance but as conductor not soloist. Had this been an EMI box we would have had notes by Michael Kennedy or Jerrold Northrop Moore. Here instead we have a concisely acceptable introduction by Decca 'staffer' Kenneth Chalmers. The Falstaff is from a conductor and orchestra we more readily associate with Ravel and de Falla. Dutoit's virtuoso version has puckish humour and fantasy as well as a Straussian pawkiness. It is recorded most brilliantly with both intricacy and impact. This Gerontius was for years a staple of the Decca catalogue. It is recorded in a grandly commodious acoustic which swallows some of the impact. Boult�s tenor (EMI) easily outpoints Peter Pears whose tonal pallor and vibrato are not well suited to the music though John Shirley-Quirk and Yvonne Minton are both excellent as are the choirs of the LSO and of King's College. This is an over-rated mournfully lachrymose work and my lack of enthusiasm is coloured by this. Many with more predictable tastes will take delight in reacquainting themselves with a performance they enjoyed on LP all those years ago. Of course it has been issued on CD before. It falls to Mackerras to give us Sea Pictures and a whole disc of the lighter Elgar. The Pictures are handled with utmost delicacy and inwardness and Della Jones has an intimacy to match but in The Swimmer I feel that she is too reticent and I wondered about the strength of her voice at least in this context. Mackerras and the orchestra of Welsh National Opera recorded hours of Delius in the 1980s and Decca issued it under the Argo imprint. The lighter, playful or hushed Elgar items derive from the same sequence of sessions. They equate to the major works as Sibelius's theatre music does to the symphonies. Delibes and Massenet are the kinfolk here and that also applies to the Dream Children. Solti's 1970s immersion in Elgar represented something of a Damascus Road experience for some of us. When Solti's headlong and headstrong Second Symphony was first issued there was a critical fuss from the Elgarian grandees. Solti takes the work at a hussar-charge gallop and restores an irresistible redbloodedness and passion that has leeched gradually out. I feel extremely affectionate towards this recording simply because it drew from me my first really positive reaction to Elgar. I had heard the 1970s Boult recordings (Lyrita REAM and EMI ASD) and the old Barbirolli version (the one that took up a 2 LP set!) and been left largely unmoved. Handley on CFP with that shattering organ presence was much better. Solti ripped up the old assumptions and found excitement, snap and splendour in this grandiloquent work. Try the last three minutes of the Allegro vivace e nobilmente and the hoarse rasping bark of the horns in the Rondo. He still finds time for the Larghetto to bloom and stretch. In my experience no-one has built the crushing, slashing, silvery emotional landslide at its peak [6.13] as well as Solti. In the First Symphony bravura playing, steely pliant control and pulse-acceleration take the music further out beyond Brahms and Strauss to Tchaikovsky. Brahms' Fourth leaps to mind pretty often in the fourth movement of the First Symphony as does Tchaikovsky again (particularly the Fifth and the Pathétique). Solti is an alchemist in this music and that he achieves this with Boult's own orchestra is further testimony to his inspirational way with orchestras. Hearing his recordings again has been a joyous and visceral experience and the same applies to In the South and the Marches. His In the South can be counted with Silvestri's explosively visceral Bournemouth recording (EMI Classics) - the latter still a first choice. Solti's Cockaigne is rather closer to Beecham's iconoclastically sanguine performance (on Sony) than to Boult's mainstream. What saturated glories Solti would have wrung from Arthur Butterworth's Northern Cockaigne, the overture Mancunians, an event, sadly, never to be. Not entirely surprisingly it was Beecham I thought of again during the Enigma. This is flighty, heartfelt, shivery, torrential, rasping, a little breathless (Solti often tested his orchestras with Porsche-tempi - the exact opposite of late Bernstein), balletic and regal. Solti turns the metaphorical water-cannons on Elgar and the music comes up in Technicolor dazzle. It does not make me want to give up looking for the Norman del Mar/RPO version but it is a grandly pleasurable listen all the same. Be warned that there is some treble edginess at fortissimo. The analogue tape is all but thirty years old. The Solti version of the Violin Concerto is in the hands of Kyung Wha Chung. Her tone is steady, sweetly slender and shapely, bringing out the instrument's soprano fach. Hers is a searching rapier tone - silver-steel - a Toledo blade. This is yet a further good version of a work already blessed with a host of healthy, touching and exhilarating recordings: Accardo (Collins - deleted), Bean (an old CFP LP with Charles Groves - surely in line for reissue), Oistrakh (Olympia - long gone now); Heifetz (outstanding with Sargent on Naxos), Zukerman (one of his finest recordings - Sony Essential Classics) and Sammons (unmissable - Naxos). The Kingsway Hall provides its usual exhilarating acoustic. All the Solti recordings are aided by Kenneth Wilkinson's engineering and the lively, analytical yet sonorous qualities of the still lamented Kingsway Hall. The Julian Lloyd Webber/Menuhin Cello Concerto is well worth hearing. As so often with this cellist the impression of spontaneity is strong. He plays with great technical command and a striking ability to transfer his concentration to the listener. There is some 'reinvention' in the invigorating little inflections and holdings-back of the flow. After a heartfelt Adagio the Allegro goes with a swing and a touch of the Nielsen's orgoglioso. Recording quality is subtly lit with acres of detailing and no shortage of thumping impact. Marriner's rather warm and breathily close-up Serenade is winningly done - similarly with Elegy and Sospiri. This is a convincing performance beside the usual pallid parade. Indeed Marriner's Introduction and Allegro might well have made a much more magnetic companion than Britten's. Britten's version is a slender thing of Mozartian delicacy, precision and athleticism. Britten chose a way quite other than that espoused by Barbirolli in his classic EMI account or by Handley on Classics for Pleasure. You will certainly find it a palate cleanser when surfeited with the school of the heart-racing dash and voluptuous surge. However this is nowhere near a first recommendation in my book. Superb work though from the gilded quartet of Emanuel Hurwitz, José Luis Garcia, Cecil Aronowitz and Bernard Richards who are faithful to the Britten ethic. The booklet is a model of the conciser sort. English only. All sung words printed. Fullish discographical information. The girder-like and irresistible strengths of this set are to be found in Solti's pulse-quickening Elgar. Also impressive are Falstaff, the Cello Concerto and much to my surprise, the Serenade. The Gerontius, though much celebrated, is not compelling and neither are the Mackerras tracks - competent and touching but not special. Solti was a damned fine Elgar interpreter inclined to shake the rafters. He was obviously convinced that Elgar was for the world; not exclusively for the supposedly milk and water sensibilities of the Brits.